Snow is a type of precipitation in the form of crystalline water ice, consisting of a multitude of snowflakes that fall from clouds. Each snowflake is an aggregate of ice crystals that forms while falling through and beneath a cloud. As it is composed of small ice particles, snow has a granular texture. In addition, it has an open, soft structure, unless packed by external pressure. Snow can act as an insulator that conserves the heat of the Earth, protecting crops from sub-freezing weather. On the other hand, substantial snowfall can disrupt infrastructure and services. Large, well formed snowflakes are relatively flat and have six roughly identical arms, so that the snowflake nearly has the same 6-fold dihedral symmetry as a hexagon or hexagram. This symmetry arises from the hexagonal crystal structure of ordinary ice. However, the exact shape of the snowflake is determined by the temperature and humidity at which it forms.. Rarely, at a temperature of around -2 °C (28 °F), snowflakes can form in threefold symmetry—triangular snowflakes. Snowflakes are not perfectly symmetric however. The most common snowflakes are visibly irregular, although near-perfect snowflakes may be more common in pictures because they are more visually appealing. Snowflakes can come in many different forms, including columns, needles, and plates (with and without "dendrites"—the "arms" of some snowflakes). These different forms arise out of different temperatures and water saturation, among other conditions. Six petaled ice flowers grow in air between 0 °C (32 °F) and -3 °C (27 °F). The vapor droplets solidify around a dust particle. Between temperatures of -1 °C (30 °F) and -3 °C (27 °F), the snowflake will be in the form of a dendrite or a plate or the six petaled ice flower. As temperatures get colder, between -5 °C (23 °F) and -10 °C (14 °F), the crystals will form in needles or hollow columns or prisms. When the temperature becomes even colder (from -10 °C to -22 °C) the ice flowers are formed again, and at temperatures below -22 °C, the vapors will turn into prisms again. If a crystal has started forming at around -5 °C, and is then exposed to warmer or colder temperatures, a capped column may be formed which consists of a column-like design capped with a dendrite or plate-like design on each end of the column. At even colder temperatures, the snowflake design returns to the more common dendrite and plate. At temperatures approaching -20 °C, sectored plates are formed which appears as a dendrite, with each dendrite appearing flattened, like the design of a snowflake plate. There are, broadly, two possible explanations for the symmetry of snowflakes. First, there could be communication or information transfer between the arms, such that growth in each arm affects the growth in each other arm. Surface tension, or phonons, are among the ways that such communication could occur. The other explanation, which appears to be the prevalent view, is that the arms of a snowflake grow independently in an environment that is believed to be rapidly varying in temperature, humidity, and other atmospheric conditions. This environment is believed to be relatively spatially homogeneous on the scale of a single flake, leading to the arms growing to a high level of visual similarity by responding in identical ways to identical conditions, much in the same way that unrelated trees respond to environmental changes by growing near-identical sets of tree rings. The difference in the environment in scales larger than a snowflake leads to the observed lack of correlation between the shapes of different snowflakes. The sixfold symmetry happens because of the basic hexagonal crystalline structure from which the snowflake grows. The exact reason for the threefold symmetry of triangular snowflakes is still a mystery although trigonal symmetry is a subsymmetry of hexagonal. There is a widely held belief that no two snowflakes are alike. Strictly speaking, it is extremely unlikely for any two objects in the universe to contain an identical molecular structure; but there are, nonetheless, no known scientific laws that prevent it. In a more pragmatic sense, it's more likely—albeit not much more—that two snowflakes are visually identical if their environments were similar enough, either because they grew very near one another, or simply by chance. The American Meteorological Society has reported that matching snow crystals were discovered by Nancy Knight of the National Center for Atmospheric Research. The crystals were not flakes in the usual sense but rather hollow hexagonal prisms. Snow remains on the ground until it melts. 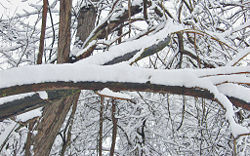 In regions with subfreezing climates, the snow may lie on the ground all winter. If all of the snow does not melt in the summer, it may become a glacier. This is often called snowpack, especially when it persists a long time. The deepest snowpacks occur in mountainous regions. It is influenced by temperature and wind events which determine melting, accumulation, and wind erosion. The water equivalent of the snow is thickness of the layer of water having the same content. For example, if the snow covering a given area has a water equivalent of 50 cm, then it will melt into a pool of water 50 cm deep covering the same area. This is a much more useful measurement to hydrologists than snow depth, as the density of even freshly fallen snow widely varies. New snow commonly has a density of between 5 and 15 percent of water. Snow that falls in maritime climates is usually denser than snow that falls in mid-continent locations because of the higher average temperatures over oceans than over land masses. Cloud temperatures and physical processes in the cloud affect the shape of individual snow crystals. Highly branched or dendritic crystals tend to have more space between the arms of ice that form the snow flake and this snow will therefore have a lower density, often referred to as "dry" snow. Conditions that create columnar or platelike crystals will have much less air space within the crystal and will therefore be more dense and feel "wetter." Once the snow is on the ground, it settles under its own weight (largely due to differential evaporation), until its density is approximately 30 percent of water. Increases in density above this initial compression occur primarily melting and refreezing, caused by temperatures above freezing or by direct solar radiation. By late spring, snow densities typically reach a maximum of 50 percent of water. Spring snow melt is a major source of water supply to areas in temperate zones near mountains that catch and hold winter snow, especially those with a prolonged dry summer. In such places, water equivalent is of great interest to water managers wishing to predict spring runoff and the water supply of cities downstream. Measurements are made manually at marked locations known as snow courses, and remotely using special scales called snow pillows. Many rivers originating in mountainous or high-latitude regions have a significant portion of their flow from snowmelt. This often makes the river's flow highly seasonal resulting in periodic flooding. In contrast, if much of the melt is from glaciated or nearly glaciated areas, the melt continues through the warm season, mitigating that effect. Snowpack heat and mass balance. The energy balance of the snowpack is dictated by several heat exchange processes. The snowpack absorbs solar shortwave radiation that is partially blocked by cloud cover and reflected by snow surface. A longwave heat exchange takes place between the snowpack and its surrounding environment that includes overlaying air mass, tree cover, and clouds. Convective heat exchange between the snowpack and the overlaying air mass is governed by the temperature gradient and wind speed. Moisture exchange between the snowpack and the overlaying air mass is accompanied with latent heat transfer that is influenced by vapor pressure gradient and air wind. Rain on snow could induce significant heat input to the snowpack. A generally insignificant conductive heat exchange takes place between the snowpack and the underlying ground. Animation of snowcover changing with the seasons. Snow serves as a thermal insulator conserving the heat of the Earth and protecting crops from subfreezing weather. But substantial snowfall sometimes disrupts infrastructure and services, even those of a region that is accustomed to such weather. Automotive traffic may be greatly inhibited or may be stifled entirely. Basic infrastructures such as electricity, telephone lines, and gas supply can also be shut down. 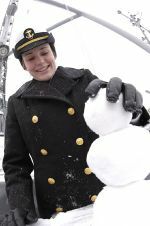 This can lead to a "snow day," a day on which school sessions or other services are canceled owing to an unusually heavy snowfall. In areas that normally have very little or no snow, a snow day may occur with light accumulation or even the threat of snowfall, as those areas are ill prepared to handle any amount of snow. A mudslide, flash flood, or avalanche can occur when excessive snow has accumulated on a mountain and there is a sudden change of temperature. Several forms of recreation depend on snow. Examples are given below. Throwing snowballs mutually in a snowball fight or at others to tease them. The world's biggest snowcastle, the SnowCastle of Kemi, is built in Kemi, Finland every winter. Hoar frost grows on the snow surface due to water vapor moving up through the snow on cold, clear nights. A long-lasting snow storm with intense snowfall and usually high winds. Particularly severe storms can create whiteout conditions where visibility is reduced to less than 1 meter. Rain that freezes on impact with a sufficiently cold surface. This can cover trees in a uniform layer of very clear, shiny ice—a beautiful phenomenon, though excessive accumulation can break tree limbs and utility lines, causing utility failures and possible property damage. 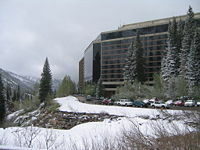 Snowbird ski resort, one of the snowiest places in the U.S.
A layer at the bottom of old snowpack, consisting of coarse, sugar-like ice crystals and air. Subnivean animals live in the pukak layer because its temperature is generally stable at a few degrees below freezing and it can be tunneled through with relative ease. In Britain, rain mixed with snow; in America, ice pellets formed when snowflakes pass through a layer of warm air, partially thaw, then refreeze on further descent. Granules of snow or ice pellets formed when supercooled water accretes on ice crystals or snowflakes. Snow on ground that is being moved around by wind. 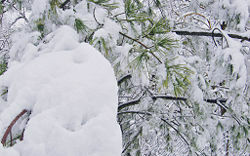 A double layer of snow in which the lower layer may be powdery dry but where the surface is frozen together into a stiff, icy surface, which often can support human weight. Snow that is at or near the melting point, so that it can easily be packed into snowballs and hurled at other people or objects. This is perfect for snow fights and other winter fun, such as making a snowman or a snow fort. Freshly fallen, uncompressed snow. The density and moisture content of powder snow can vary widely; snowfall in coastal regions and areas with higher humidity is usually heavier than a similar depth of snowfall in an arid or continental region. Light, dry (low moisture content) powder snow is prized by skiers and snowboarders. It is often found in the Rocky Mountains of North America and in Niseko, Japan. The highest seasonal total snowfall ever measured was at Mount Baker Ski Area, outside of Bellingham, Washington, in the United States, during the 1998–1999 season. Mount Baker received 1,140 inches (29 m) of snow, thus surpassing the previous record holder, Mount Rainier in Washington, which received 1,122 in. (28.5 m) of snow during the 1971–1972 season. Guinness World Records lists the world’s largest snowflakes as having fallen in January 1887, at Fort Keogh, Montana—it is said that one of them was 15 inches (38 cm) wide. ↑ Michael Klesius, "The Mystery of Snowflakes," National Geographic 211(1) (2007). ↑ Snow Crystals Retrieved October 12, 2015. ↑ State of California, Snow: Depth and Density. Retrieved July 26, 2007. ↑ Hamed Assaf, "Development of an Energy-budget Snowmelt Updating Model for Incorporating Feedback from Snow Course Survey Measurements," J. Engineering, Computing, and Architecture 1 no. 2 (2007). Retrieved July 26, 2007. ↑ NOAA, Mt. Baker Holds Snowfall Record, NOAA Reports August 2, 1999. Retrieved October 12, 2015. Klesius, Michael. 2007. The Mystery of Snowflakes. National Geographic 211 (1): 20. Libbrecht, Kenneth G. 1999. A Guide to Snowflakes. SnowCrystals.com. Retrieved July 23, 2007. Libbrecht, Kenneth G. 1999. Frequently Asked Questions. SnowCrystals.com. Retrieved July 23, 2007. Nakaya, U. 1954. 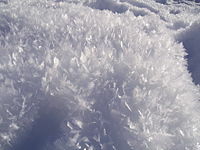 Snow Crystals: Natural and Artificial. Cambridge, MA: Harvard University Press. Snow at above freezing temperatures. ScienceBits. Global Outlook for Ice and Snow. United Nations Environment Programme. This page was last modified on 12 October 2015, at 20:37.